Degaroute used in road markings in Dubai. Evonik, one of the world’s leading specialty chemicals companies, says it had recently supplied its key solutions to Dubai’s Road and Transport Authority (RTA) for a road infrastructure project in the emirate. The RTA project was completed in collaboration with Prismo Gulf, a UAE-based contractor for road and bridge maintenance and street rehabilitation, says the company. 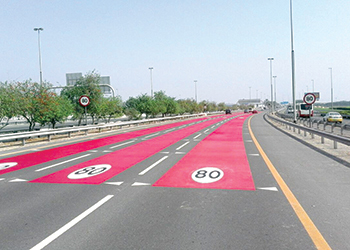 According to Evonik, the company’s Degaroute-based cold-plastic system was utilised to create very visible red road markings on Dubai-Al Ain road indicating the reduction in speed limit at a high traffic volume area. Degaroute not only helps to prevent accidents, the product range also has an outstanding ecological footprint due to its durability, says the German firm. This binder effectively and economically enhances road safety because it can be used to create road marking systems with specific features, such as reflectivity, anti-skid, high visibility and longevity, it adds. Evonik began the first set of trials for this project in October 2013 followed by a second one in June last year. The project rolled out in June 2017 with the municipalities and road transport authorities in the UAE keen on enhancing road safety in the country in order to meet the agenda set forward by Federal National Council to reduce road fatalities.